The biggest advantage of using laser is that it causes almost no pain as well as minimal bleeding. The biggest advantage of using laser is that it causes almost no pain as well as minimal bleeding. Plus, most dental treatments performed with laser don’t require a shot! 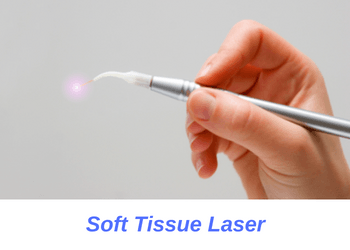 For our laser treatment we utilize the versatile Odyssey soft tissue laser system. Pulse oximeter is used for oral conscious sedation dental treatment. The pulse oximeter machine monitors your blood pressure, heart rate and hemoglobin blood saturation. The device sends an automatic alert should your vitals fall below a safe level. This alerts your doctor to take corrective measures to get you back into a safe zone. We use the hospital grade Criticare eQuality Patient Monitor system for our oral conscious sedation monitoring. 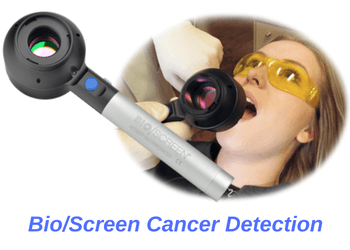 Bio/Screen Oral Exam System to assist in diagnosing cancerous and pre-cancerous lesions. Oral cancer accounts for nearly 1% of all cancers with 50,000 new cases diagnosis each year. Like most other cancers, early detection is key to long-term survival. We have invested in the latest technology known as Bio/Screen Oral Exam System to assist in diagnosing cancerous and pre-cancerous lesions. The Bio/Screen device emits a special blue light which identifies early stage tissue alterations invisible to the naked eye. 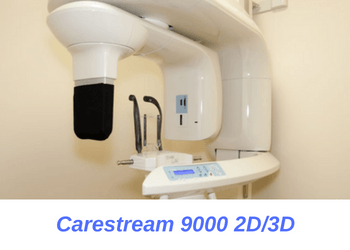 We use the Carestream 9000 2D/3D X-ray machine, manufactured by Kodak, for our panoramic and CT imaging. Advanced imaging essential for performing surgical procedures like dental implants and wisdom tooth extraction. Panoramic X-ray captures your jawbone to show missing teeth, impacted wisdom teeth and suspicious oral lesions. CT scan captures 3-dimensional images used to identify nerve and sinus position for ideal dental implant placement. We use the fabulous Carestream 9000 2D/3D X-ray machine, manufactured by Kodak, for our panoramic and CT imaging. Did you know that digital X-rays emit nearly half the radiation of traditional X-rays? Plus, digital X-rays are quicker, more comfortable and capture more details than traditional film X-rays. We proudly use Schick digital X-ray sensors for our digital radiography. We use intraoral camera to capture photos of your teeth and gums. Using an intraoral camera is a great supplement to X-rays since pictures help us better visualize what’s going on inside your mouth. We use intraoral camera to detect tartar buildup, teeth cracks, broken fillings and other superficial defects. Plus, we our intraoral camera can help track your progress during cosmetic dentistry treatment. It’s great to be able to see before and after pictures of treatment such as teeth whitening or porcelain veneers right on the computer screen! ZOOM uses a special LED light to break down hydrogen peroxide gel particles to accelerate the whitening process. 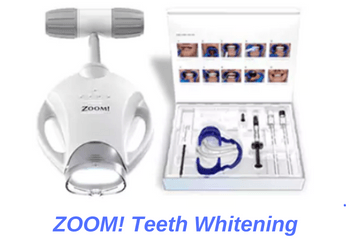 Zoom teeth whitening system is undoubtedly one of the best teeth whitening systems available. The system uses a special LED light to break down hydrogen peroxide gel particles to accelerate the whitening process. This yields better results in a shorter time. We carry the latest Zoom! LED light, known as Advanced Power Plus, which is very effective and causes minimal post-treatment sensitivity. Since we perform all various phases of dental implant treatment we also have plenty of implant equipment. There include Zimmer implant motor, Dentium sinus graft kit, block bone graft screw-mesh kit and a dental implant retrieval system. As you can see, we’re prepared to do it all when it comes to dental implants! No matter your dental implant needs, we can fix your problem. We offer several different implant systems including Zimmer, Hiossen and Dentis dental implants. Rotary root canal, or rotary endo, significantly facilitates and improves root canal therapy. Rotary endo is a device which uses subtle calculated oscillation to automatically clean out your tooth nerve canals. Using rotary endo makes root canal treatment quicker and much more precise. In our office, we use two different rotary root canal systems of Militex Union Broach and NSK rotary system. We also use SybronEndo Touch ‘N Heat to dissect the root canal Gutta Percha with extreme precision. If you have any questions about our advanced dental technology, give us a call today. Call us at (949) 481-2540 or book your appointment online. We are happy to discuss more details about our fancy technology and help you explore your various treatment options. Give us a call to learn more about our advanced technologies and how we can help you achieve the smile of your dreams.